This post is not about any of my usual software or hardware topics, but it still is nerdy. Parliament's classic song on the subject tells us that "everybody's got a little light under the sun." It's good to have a little light, especially when the sun isn't around. But some little lights are better than others. The best thing that has happened to flashlights in recent years, especially little ones, is the rise of the LED. Compared to their predecessors, LED lamps are smaller, more efficient, more durable, and much longer burning. 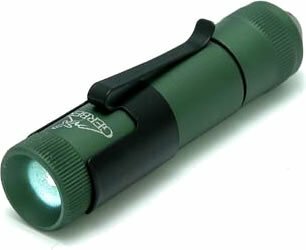 My mainstay pocket flashlight for years was a "CMG Infinity Ultra". The dumb name was forgivable because of the overall greatness of this light. It's a little cylinder of machined aluminum with an AA battery inside and a bright white LED on the end. Sealed, waterproof, incredibly rugged, and 10 or 20 hours of light on a charge. One day, after years of reliable service on camping trips and other adventures, it went dark. Via email I asked Gerber (who had bought CMG) what to do. In short, they said, "send it in." I did. A couple weeks later I came home to an envelope from them containing a brand new replacement light in retail packaging. Very nice. This particular style of light -- durable, simple, waterproof, LED, long hours on a rechargeable single cell -- is not easy to find. Big credit to Gerber for keeping it going and keeping me equipped.